The 4th generation of Nord's award-winning Piano series combines greatly expanded voice polyphony, a premium Triple Sensor keybed and the acclaimed Virtual Hammer Action Technology for the ultimate piano experience. The Nord Piano 4 also includes brilliant new performance features like Seamless Transitions, dedicated Piano Filters and Split Point Crossfades delivering a live focused keyboard with exceptional piano feel. Piano 4 features seamless transitions when changing sounds or programs while playing. There's dedicated knobs and buttons for all essential functions required in a live performance situation. Transposing, setting up a split point or creating a layered sound can be accomplished in seconds. All of these features add up to an enhanced live performance. 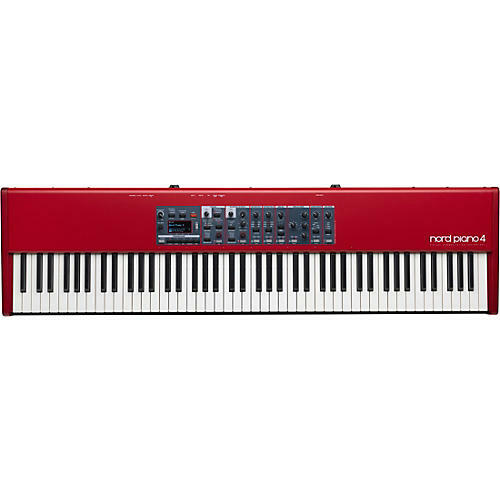 The Nord Piano 4 factory bank contains Nord's latest Grands, Uprights, Electric Pianos and Digital Pianos from the exclusive Nord Piano Library - all handpicked for their unique characters. Nord’s state-of-the-art sampling techniques capture the extraordinary nuances and real character of the source instruments with breathtaking realism. All sounds can easily be replaced using the Nord Sound Manager. The exclusive Nord Piano Library is constantly updated with new unique world class sounds, and always free of charge. Nord's unique Advanced String Resonance reproduces the intricate interplay of piano strings resonating at their fundamental or harmonic frequencies when other notes are played on the Upright and Grand piano sounds. Providing an additional level of sonic control, the Piano Section now features dedicated piano filters for accentuating softness, mid or brilliance. Piano 4's keyboard technology makes both top and bottom triggering possible, resulting in amazing control when playing percussively as well as pianissimo with the keys half-pressed down. The keybed has added weight for improved dynamic control providing authentic Piano touch and feel. The individual Fatar keybeds are meticulously calibrated at the Nord factory to ensure an even response over the whole range.